A reader of this blog passed this clipping onto me which recounts the story of naturalist Gavin Maxwell's sighting of something strange in Loch Ness about 70 years ago. As you may know, Gavin Maxwell was the author of the acclaimed book, "Ring of Bright Water". During the late 1960's, a wave of sightings and press reportings began to take hold of the British public's imagination, on the existence of a possible monster in Loch Ness. I distinctly remember that Summer of 1969, as a boy of 11 years old travelling down with my family from Inverness to Arisaig and witnessing the hysteria of tourists jamming every layby down the A82. This wasn't helped by the various TV cameras set-up on timber custom-build platforms every 5 miles down the lochside hoping to bring 'live' sightings of 'Nessie'. An article in The Scotsman newspaper dated 2nd August 1969 confirms that even Gavin Maxwell was a believer in this mystery. This article was published just five weeks before Gavin Maxwell died on the 7th September, about the same time that Gavin realised he had cancer according to Richard Frere. This article was/is possibly the last published writings of Gavin Maxwell. It was in September 1945. I was driving from Inverness to Mallaig. The weather was dull, drizzle, flat calm, and about five or six miles on the Inverness side of Invermoriston I stopped to relieve myself. There was a knoll about 80 feet above the loch. 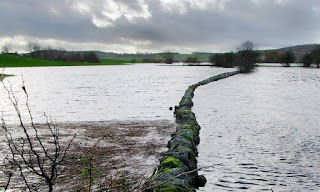 While walking round the broom bushes on this knoll, I noticed what appeared to be a line of stones, a submerged wall stretching out from the shore, perhaps 20 to 30 feet in all, shining wet. Perhaps two minutes later I returned. The “stones” were not there: there was only a slight disturbance in the water which subsided very quickly. I waited half an hour and saw nothing more. I must admit I like Maxwell's almost prophetic reply to the skepticism of today when he classes himself as no fool as regards the accuracy of what he saw and would probably not take kindly to someone taking him by the hand to "help" him in what "he really saw". Given his stated two years of sea observation and a lot more years as a naturalist who observed the moods of the Scottish landscape on land and water, I would class him as a seasoned and experienced witness. Having said that, what did Gavin Maxwell see? He said he had driven south to a point four miles out of Invermoriston, that places us somewhere just north of the Alltsigh burn that runs into Loch Ness and is the location of the famous John McLean sighting about eight years before as well as the curious land sighting of Alfred Cruickshank in 1923. I scouted this area last year in connection with the McLean and Cruickshank cases and one likely spot for Maxwell's story is shown below. This is the shingle beach that runs past the back of the Youth Hostel and I walked it from Alltsigh Burn northwards until it ran out. 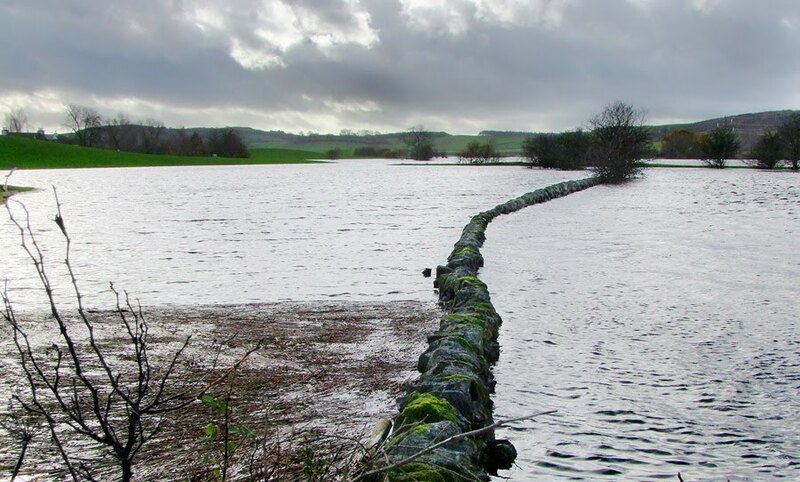 The object was described as looking like a row of partially submerged stones commonly seen on drystone walls. 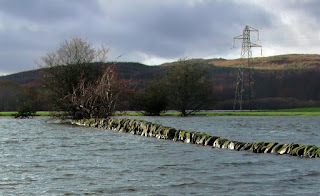 Not being exactly sure how that would look, I did an search for some similar images and came up with the following pictures of submerged walls below, though I do not claim that they are an accurate representation of what Maxwell saw. The suggestion is therefore that the appearance of the object is somewhat narrower compared to normal hump like reports. Did Gavin Maxwell observe the uppermost part of the creature's back as it lay still just under the water near the shore? Or was it a line of stones just as the description suggests? After all, the account says it ran perpendicular to and close to the shore line. For what it is worth, I walked along this area right up to Alltsigh Burn and I certainly do not recall a line of "stones" similar to that described by Maxwell (albeit 70 years later). The main point, though is that the objects were not there when Maxwell returned from relieving himself a couple of minutes later. If they were still there, we would never have heard this story. His mention of drizzle allows for the idea of the loch level rising from previous rainfall. 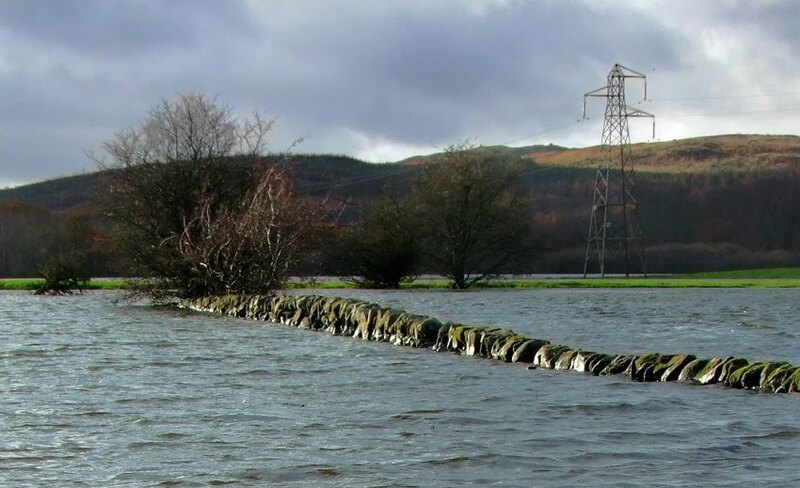 However, given that he returned only two minutes later, it is unlikely the loch level would have risen that quickly and certainly other stones round about would have given that explanation away. In conclusion, Gavin Maxwell's experience is not one that is going to make it into the classic sightings list. The fact we know about it is more to do with the man rather than the story. Nevertheless, it has taken its place in Loch Ness Monster history and people will form whatever opinion on it. The Maxwell family connection to Nessie was probably the strongest via his brother Eustace. He had a boat on the loch in the early days of the search and was very active there up until his death. Ted Holiday mentions him directly in ‘The Dragon and the Disc’: ‘In 1969…Major Eustace Maxwell chartered a trawler and a crew of professional fishermen. Bringing these into Loch Ness, he trawled the bottom but brought up only leaves and some plastic bags. Hundreds of large hooks, baited with herring, were lowered to the loch-bed by cable but nothing relating to the mystery was captured’ (pp31-32). In a later chapter, Holiday also mentions that Eustace Maxwell had told him of a Nessie-type sighting of his own in Loch Fyne: ‘Major Eustace Maxwell told me how he once saw a huge hump projecting out of Loch Fyne which he took to be a sandbank. As the car moved behind some trees, he knew it couldn’t possibly be a sandbank. When the car was at once reversed to the original spot, the object had gone’ (p184). 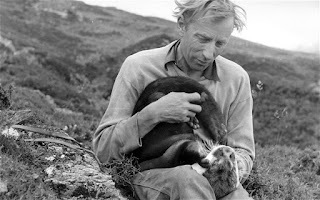 I also recall reading in Douglas Botting's biography of Gavin Maxwell, ‘The Saga of Ring of Bright Water; The Enigma of Gavin Maxwell’ that when one of his otters (Edal) savaged a visitor (Margaret Pope), Maxwell was so frightened of the potential for bad publicity that he asked her to put the story about that she had actually been bitten by something while paddling in Loch Ness! Not sure if this story ever did fully do the rounds, but it's quite interesting grist for the LNM mill nonetheless.